Broken sun roof? A sun roof that doesn’t work in the sunny weather and leaks in the rainy weather won't do – but we can fix that! So much can go wrong with your sunroof, it’s hard for most people to know what to fix: the timing can be thrown off, the channels and cables can break leaving it stuck closed – or worse, stuck open. Parking under trees can clog the drains that make sure water doesn’t sit on top of your sunroof, damaging it. If you see water filling your dome light or coming in by your feet, it’s possible your sunroof drains are blocked. 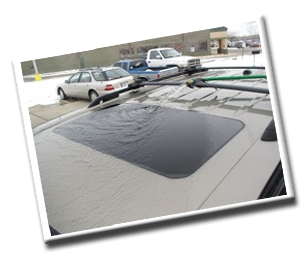 We can even fix the shade that covers your sunroof when not in use. We can help! We can install a brand new sunroof in your car, taking you from uncool to unreal.